Keeping fast-growing grass at bay can be hard work, especially in the summer. But Swiss Federal Railways has come up with a way to maintain the embankments near its tracks, with the help of some very woolly (and hungry) four-legged friends. In an effort to prevent disruptions to train services and preserve green spaces, the state-owned rail operator tends to around 2,700 hectares of embankments along its network. But some of those areas aren't particularly easy to reach by conventional lawnmowers – so the company decided to think outside the box. That thinking led them to “tools” that were much cuter than a standard grass cutter. 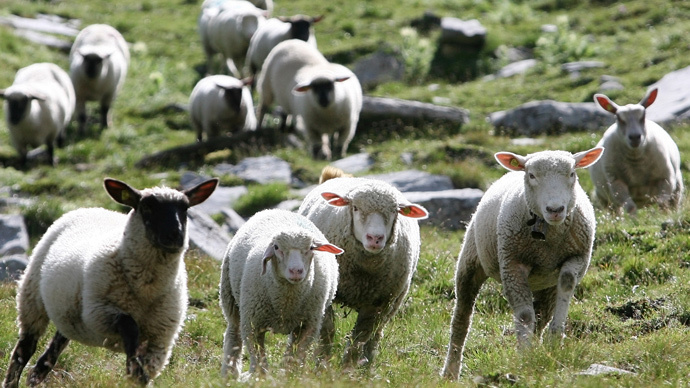 Swiss Federal Railways, or SBB, has decided to "employ" 80 Skudde sheep on its embankments, though it can likely be assumed they'll be paid in grass – not cash. The company has praised the animals' many benefits. For starters, a single sheep can trim 10 to 20 square meters of grass per day – the size of a large bedroom. And they don't need supervision, because eating is what they do best. In fact, they only sleep around two hours a day, leaving lots of time for chewing on blades of grass. The animals actually promote biodiversity because “they eat carefully instead of mowing everything down like a machine,” the company said, as quoted by The Local. This allows for the protection of more meadow plants, since sheep do little damage to the ground – unlike their cow counterparts. Animal lovers needn't worry about the sheep's positioning next to the rail tracks. According to SBB, the noise doesn't bother them and they're kept away from the railed by electrified fencing. Those barriers are reinforced with “snow netting” in steeper areas. The company has provided a map on its website, which details where the sheep will be this summer. Skudde sheep are a rare domesticated breed which was threatened with extinction from Switzerland in the 1970s. The animals are protected by ProSpecieRara, a Swiss nonprofit organization aimed at preserving rare species of animals and plants.